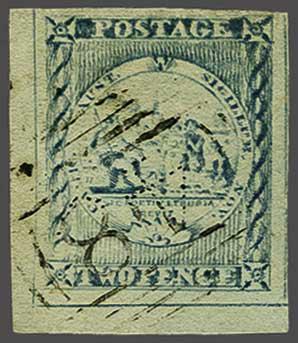 1850 (Jan 1): 2 d. dull blue, later impression, Plate I, position 13, a fine corner marginal used example from lower left of sheet, huge margins on three sides and clear at top, cancelled by "48" numeral obliterator of Tarcutta. A fine and scarce usage. Signed A. Diena Gi = £ 180.